LAS VEGAS, NV – January 7, 2014 — /BackupReview.info/ — Lenovo (HKSE: 992) (ADR: LNVGY) today announced at the 2014 International Consumer Electronics Showa portfolio of devices geared toward the home to allow users to enjoy, connect and interact with their media and content. These devices include the Lenovo Beacon personal cloud storage device, the Lenovo N308 Android home computer, the Lenovo Horizon 2 Table PC and the Lenovo A740 All-in-One (AIO) PC. Lenovo’s first personal cloud storage device, Beacon, allows users to easily store and share multimedia via their PC or mobile device in the home or remotely1. Using the downloadable Android app created for Beacon, users can even turn their Android smartphone into a remote control for the Personal Cloud Storage Device. As Lenovo’s first Android desktop, the Lenovo N308 AIO provides access to a world of apps on its 19.5-in multitouch display starting at $4502. The Horizon 2 Table PC expands upon Lenovo’s leadership in multimode computing with a radically thinner and more portable design, and as the thinnest 27-in AIO3, the Lenovo A740 creates a versatile and stylish home PC. Perfect for families or those who want to access their media library on the go, the Beacon personal cloud storage device lets users store and play their media from anywhere using their smartphone, PC, tablet or TV1. Easier to use than NAS-storage type devices, Beacon lets users upload files either wirelessly or via an onboard USB connection with just the press of one button.Users can seamlessly access files around the home or on-the-go, and Beacon’s secure access rights make it a great device to share with multiple users. Beacon makes it simple for users to capture and relive memories from personal media: With the camera auto upload feature, shutterbugs can automatically upload a photo from their smartphone’s camera via WiFi or 3G4 to store a copy of it on Beacon. Using Lenovo’s custom app, users can even use their Android smartphone as a remote control to play their multimedia stored on Beacon to a TV connected by HDMI. Beacon offers a more personal solution versus “in the air” cloud storage services. Files reside inside Beacon, and the device stays fixed in a physical location in the home. It offers large storage capacity easily expandable up to 6TB, and there are no monthly fees for data storage. Outside file transfer to one’s mobile device occurs seamlessly from Beacon. Beacon runs an Intel®Atom™ dual core processor, supports file transfer through 3G4, WiFi and Ethernet and comes in white or black. Lenovo’s first Android home computer, the Lenovo N308, presents an affordable AIO desktop for those multimedia mavens who love apps, entertainment and web browsing. The N308 makes an ideal companion for enjoying media and accessing apps as part of a user’s family of Android devices including tablets and smartphones. Starting at $450 and available in black or white, the 19.5-in 1600X900 touchscreen desktop gives users everything they need to enjoy their favorite content. Running the Android 4.2 Jelly Bean operating system, the N308 comes with an NVIDIA Tegra® quad core processor, up to 500 GB hard drive storage, a 720p webcam and WiFi. Easily move this 1.3-in thin AIO around the home or office as a super-sized tablet with its full-size keyboard and mouse and up to three hours of battery life4 with its integrated battery. Additionally, users can adjust the N308’s stand to lay the device flat for an easier angle to navigate the touchscreen and even play games. Lenovo is recasting the mold on the Table PC with a dramatically thinner and now also lighter 27-in Horizon 2. The slimmed down form factor measures as thin as a deck of playing cards at just 19.5mm, and shaves off weight, making it easier to transport around the home. Horizon 2 also offers improved performance with smarter features like near field communications (NFC) that interact with a user’s other devices for a truly one of a kind digital content sharing experience. For example, users can now access media from their PC or smartphone on their home network directly on Horizon 2’s display when it lays flat in Table Mode with the Aura interface activated. They can either use the new Horizon mobile app to shake their mobile Android device, allowing the content to “fall”onto Horizon 2’s screen. Or they can place the mobile device on the screen, which signals to the Aura dial to open around it and “pull” out content onto Horizon 2’s display. Also, users can edit photos and share directly from Aura to Facebook. New motion control features allow for easy navigation of photos, presentations, e-book pages and music tracks, and using Horizon 2’s new face tracing feature, users can upload photos from their camera or smartphone and the Aura interface will try to recognize the faces in the photos. The Horizon 2 also comes with dozens more new multi-user, multi-touch family entertainment including Ubisoft’s Chubby Kings; a four-player family fun game, Omnivision’s Halli Galli; a popular entertainment game; and Legacy Games’ Crayola’s Songbook; a children’s interactive musical and drawing experience along with several education apps such as I Spy from Scholastic. Horizon 2 continues the interpersonal Table PC’s focus facilitating collaborative computing in both Table and Stand Modes with its Windows 8.1 10-finger touchscreen, large traditional or hybrid storage, up to 4th generation Intel® Core™ i7 processor and Dolby®Home Theater.™ Of course, users can adjust the screen in Stand Mode for a performance AIO desktop. They can also enjoy it in Table Mode when it’s laid flat for computing together and playing games with up to four people. With nearly four hours of battery reserve5and optional table accessory, it can be transported easily from room to room. With just a 4mm thin display, the new Lenovo A740 takes the title of the thinnest AIO in its 27-in class3. Its fashion forward design gives users a premium AIO desktop experience with its stand and display back cut from a single piece of aluminum, brilliant display and latest performance technologies. Crystal clear images leap off the A740’s optional WQHD 2560X1440 display with its wide 178° viewing angle. Powered for entertainment and media by up to NVIDIA GeForce® graphics, JBL® speakers and Dolby® Home Theater,™ users can interact directly with their content on the Windows 8.1 10-finger touchscreen or even use its built-in motion and voice control. The A740 can also fold down 90° flat, making it easy to use the touchscreen. Highly equipped, the AIO also comes with up to 1 TB of hard drive storage, near field communications (NFC), fast acting ac WiFi, Bluetooth, HDMI-in support and optional TV tuner. For all the new products, Lenovo offers a portfolio of integrated services solutions including warranty extensions, warranty upgrades and premium technical support. * The Lenovo Beacon personal cloud storage device will be available beginning in April with models starting at $199 via major retailers and www.lenovo.com. 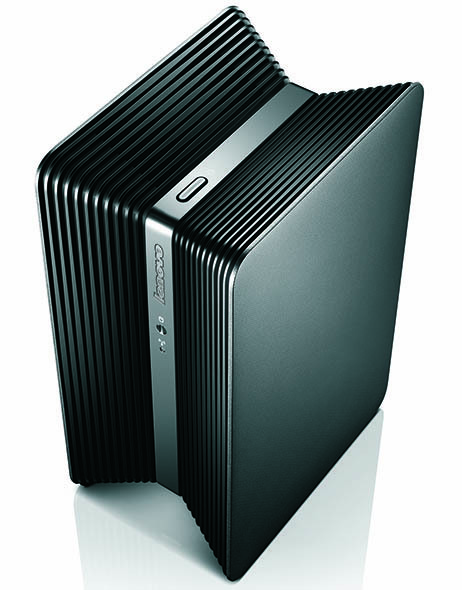 * The Lenovo N308 AIO Desktop will be available beginning in February with models starting at $450 via major retailers and www.lenovo.com. * The Horizon 2 Table PC will be available beginning in June with models starting at $1,499 via major retailers and www.lenovo.com. * The Lenovo A740 AIO Desktop will be available beginning June with models starting at $1,499 via major retailers and www.lenovo.com. 1 Beacon upload works with devices running Windows or Android. 3 Based on December 2013 market survey conducted by Lenovo of top 5 WW PC makers as defined by IDC. A740 is 4mm at edge. 4 Requires a data plan purchased separately from a carrier and not included with the device. 5 Japan Electronic Information Technology Association (JEITA) battery run time measurement method . Actual battery life, run time and recharge times will vary based on many factors, including system settings and use.